We use SSB’s ourselves quite a lot for email and also for online calendar applications. We thought therefore it would be good fun to release SSB’s for some of our apps. The first one we threw together is for SMEStorage. Just download it, unzip it, drag it to your applications folder, desktop or Mac Dock and voila you can start using your own SSB for SMEStorage. 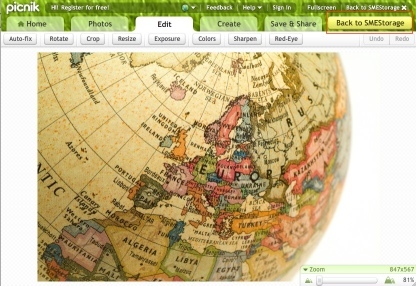 Picnik photo editing has been integrated into SMEStorage. This means that you can edit any photos you have uploaded to SMEStorage seamlessly with Picnik and then save the result back to SMEStorage. If you click the link on any image you will see that you now have an option to upload to Picnik where you can then edit your photo. Once you have made your changes you can choose “Back to SMEStorage” from Picnik and your picture will be saved back to you SMEStorage account. We’ve made a couple of changes to our SMEStorage iPhone app. The first is that we re-designed the core of the application to improve speed. This has some huge improvements if you have a lot of files and folders. For example the file list for 21,000 files and folders used to take around 20 seconds to load and this now takes around 2 to 3 seconds, and this is on the Edge network. Secondly we have implemented a “view offline” feature which allows you to load view all supported office file as a data url and therefore bookmark it for offline use. This currently works with Microsoft Word Documents, Microsoft Excel Documents, PDF’s, text files and images. It’s ideal if you want to save a particular document on the phone for reviewing later. Once you click on the link you will be warned if the size of the document is over 250K. We have tested storing 2 MB documents for offline use, but anything over 250K on Edge we feel should allow you to confirm in case you missed the document size.